NO DUPLICATES! They are all discontinued patterns from 2010. 50-CENTS per sheet! A-1 plus C and B. 2 yards Grosgrain Mini Red Hearts 1.5". Add them to your DIY craft, jewelry making, sewing, scrapbooking, card making, dolls, hair bows, etc. 2 yards Satin Pink Swiss Dot & Heart 7/8". 2 yards Satin Hot Pink Dot & Heart 7/8". 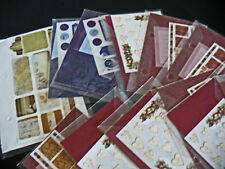 Mixed lot supplies for scrapbooking and stamping. Clear stamp set with space theme, clear stamp set with Halloween theme, and single clear fish themed stamp. Spiritually themed stickers, clear mosaic tile set(missing a few tiles), 4 white puzzles, two adhesive backed photo flip sleeves, set of six summer themed charms, and single adhesive backed, clear frame. 1 - Little Yellow Bicycle 9 piece Burlap Flowers - NA-BSH20. 2 - Little Yellow BIcycle 9 piece Burlap Circles - NA-BSH10. 1 of each - Fancy Pants Designs Stickers. 2 - Little Yellow Bicycle 9 piece Canvas Flowers - NA-CVH20. Jungle Animals. I will respond within 48 hours. Lot of (6) Alice in wonderland card-stock tags. Paint, Ink or add glitter to these pieces to make fun accents for cards, collages, scrapbooks and more! Darice-Wooden Shapes- Christmas. I am happy to review it for you. Huge Halloween Fall Scrapbooking Lot. Over 350 pieces. Bonus - 18 double sided 12 x 12 Winter Sheets. 3 Large sticker sheets. 200 diecuts/ photo corners. Item: 100% Polyester High Quality Grosgrain Ribbon Animal Print Mix Lot (R-Wild). Add them to your craft, beading, jewelry making, sewing, scrapbooking, card making, dolls, hair bows, etc. 2 yards Giraffe Animal Print 7/8". All new, crisp and clean! 2 yards Light Pink Grosgrain Princess Carriage 7/8". 2 yards Lt. Blue Grosgrain Princess Carriage 7/8". 2 yards Pink Embossed Little Daisy Flower 3/8". 2 yards Satin Pink/White "Princess" & Crown 3/8". 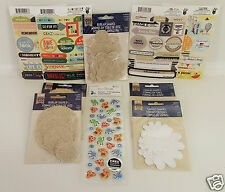 Here is a lot of NEW scrapbooking and mixed media materials. I am getting rid of my studio. All these are new in package. They include glues, Tim Holtz Distress Stains, Martha Stewart glue, Martha Stewart Large Circle Cutter, Tombow Glue Pen, and Distress Glitter. I hope you get good use out of them. The Distress Stains come in abandoned coral, chipped sapphire, and spiced marmalade. The Distressed Sprays include fossilized antique, citron and hickory smoke. This scrapbooking item containsten 12"x 12" papers, two each of five designs. All new, crisp and clean! Variety of page flags, sticky notes, note pads. They are from Target, Hobby Lobby, Dollar Tree, Michaels, Tuesday Morning. Shipped with USPS Medium Flat Rate Package. Amy Tangerine Enamel Heart Stickers - New! 2 sheets of Sonoma stickers USED (missing minimal stickers, see photos). I was an avid scrapbooker for many years when my children were young. They will be marked new unless otherwise stated. I will do my very best to describe what you are receiving. Perfect for all your paper crafting projects and more! Contents may vary. Helpful Links. Cute set for Winter or Snow Play or Skiing fun. 1 - Little Yellow Bicycle 9 piece Burlap Flowers - NA-BSH20. 1 of each - Fancy Pants Designs Stickers. 2 - Little Yellow Bicycle 9 piece Canvas Flowers - NA-CVH20. Lot includes 99% of our inventory is new and unused. There are a few other PL cards that were not bought from Studio Calico as well.